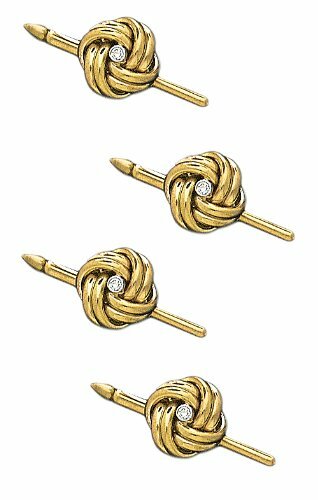 14K Yellow Gold Solid Love Knot Shirt Stud Set With Center Diamond. Total Diamond Weight .08 CT. Set of 4 Studs. Made In USA. 14K Yellow Gold Solid Love Knot Shirt Stud Set With Center Diamond. Total Diamond Weight .08 CT.
JJ Weston Love Knot Tuxedo Cufflinks and Shirt Studs. Made in the USA.